This is a SQuaRE Technical Note describing the architecture of the Git LFS service implementation. For actual documentation on deployment, as well as the source code involved in standing up this service, consult the repositories. Astronomical software code repositories often contain data for test or demo purposes. These large binary files don’t tend to benefit from version control beyond provenance and update tracking, and their history expands repository size with no return. Historically there have been a number of services to deal with this, such as git-annex and git-fat, but in terms of workflow, storing files in those back ends was too much of a departure from what seems like “normal” workflow for users. Lacking a satisfactory option, the core package afwdata was left on the in-house gitolite server after the rest of the codebase migrated to GitHub. In 2015, GitHub released a protocol and an open source reference implementation of Git LFS, a specification for dealing with large binary files in git. Aside from some upfront setup pain, the workflow was very close to “normal” GitHub flow. GitHub also released a paid hosted service for those files. Given the demand for storing data in our repositories, the cost would be non-trivial. More, we did not wish to get in a position where developers are self-censoring over what to store. Following a successful RFC, we decided to proceed with a Git LFS service. This would give users the advantages of working predominantly with the GitHub services, while allowing us to offer unmetered storage at the back end. The second request is made by the git lfs client (due to the smudge and clean filters) and uses the .lfsconfig to locate the Git LFS server it should be addressing. In our case that is git-lfs.lsst.codes. The Git LFS server checks whether the requested blob exists in the backing store, and hands the client a URL that it can use to retrive or push it. If the request requires authentication and authorization then the Git LFS server queries the GitHub API to ensure the user is an LSST org member (we can’t let anyone on the open Internet push to our server!). The client then uses the URL to fetch or push to our object store. The AWS S3 service, that provides a REST API to their object storage service. The LSST Git LFS system requires a minimum git-lfs client version of 1.1.0. This is the minimum client version that supports .lfsconfig configuration file. SQuaRE’s continuous integration system uses git-lfs client version of 1.5.5. This version supports both the batch API and the legacy API. It is recommended that users use the current stable git-lfs client version. Newer client versions support the more efficient batch API and have many bug fixes and performance improvements. This is the server implementation. It also contains the deploy instructions. This is a fork that we made of an LFS S3 implementation. We extended it because it lacked support for the git-lfs batch API. This is GitHub’s git-lfs website and links to the canonical client source code, issues and documentation. Because this was the first (and main) repo transitioned, user-oriented notes can be found in afwdata’s README. As this service is extended, it will be rehomed. 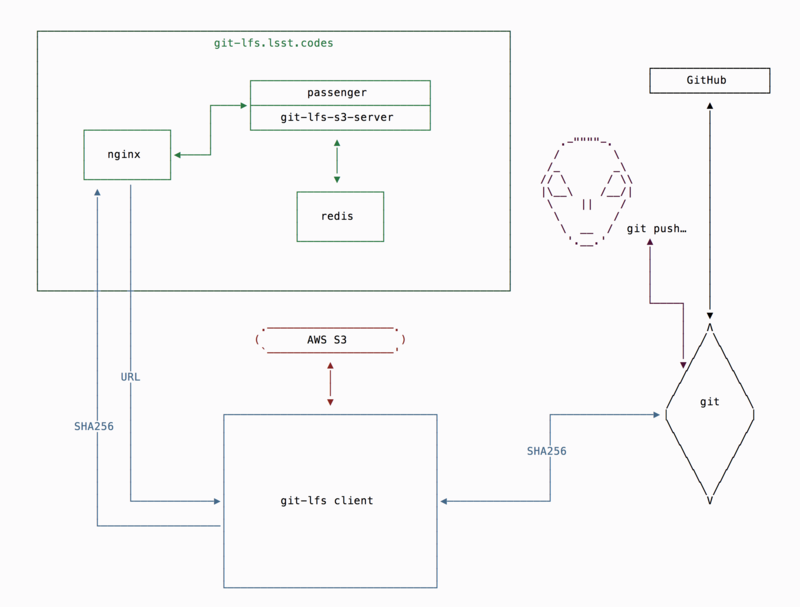 LSST’s developer guide for using git-lfs. The source for this note. This is the RFC proposing Git LFS adoption. © Copyright 2017, AURA/LSST. Last updated on Jan 17, 2018.